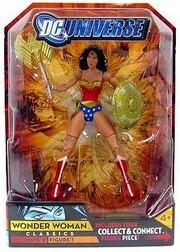 One of the best action figure toy lines ever made was first introduced in 2008 and still continues in some form today. The depth of the DC Universe of characters is enormous and goes back to 1938 with the debut of Superman. Since that time the company has produced character after character after character that are so easily recognizable to a lot of people all over the world. They have become fan favorites that have lasted for generations. There is a lot of rich history behind DC and its characters. 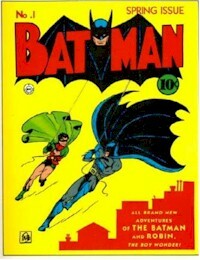 Mattel was able to negotiate the license to produce more than just Batman and Superman related figures in 2008 to expand to the entire DC Universe of characters. 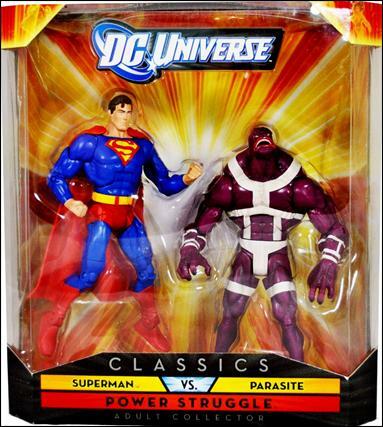 They continued their uniformed approach with the DC Universe Classics line that they had established in the Batman and Superman series of figures which they had been producing a couple of years earlier up to 2008. 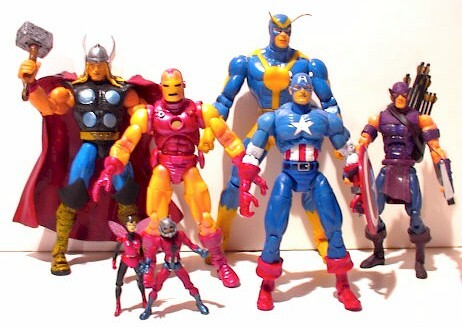 Each figure in this line for the most part basically uses the same body type for each and every figure with the characters’ unique costume design and characteristics sculpted and painted to match that individual superhero or super-villain. When you stand each figure in this line next to one another, you can see that the upper torso, lower torso, arms and legs essentially use the same parts with added adjustments where necessary to match the characters’ likeness. It’s really a unique approach when you compare to other toy lines that usually display variations from figure to figure which is not a bad thing, but with the DC Universe line each figure looks comparable to one another giving the collector a nice overall matching set of figures. The figures for the most part stand in the 6 inch range with some being taller and wider and some being shorter depending on the characters they represent. Giganta is the tallest figure in the line at 10 inches based on how the character is drawn in the comics and in animated movies and TV while Chemo is the widest emulating his comic book and animated versions. The articulation and movement of the figure’s limbs and body parts is very similar to one another with 21 points allowing most figures to be adjusted at for a myriad of human like poses. This gives collectors the opportunity to stage their figures in mock displays and dioramas and to show off their figures in various action positions. You can adjust the head, middle chest, waist arms-at a couple of points, elbows, wrists, legs-at a couple of points, knees and ankles. The paint jobs are very consistent from figure to figure. Mattel’s painters use a very clean looking paint application method that keeps the figures looking sharp and polished. I rarely find a figure that has paint scheme issues. The packaging is very uniform throughout most of the line. The packaging card graphics stayed the same for the first 11 Waves and started to change with Wave 12. Only since Wave 16 and the Green Lantern Classics Wave 1 has Mattel altered the packaging size to a slightly larger card and larger clear plastic bubble. When you display unopened package figures next to one another they too look very uniform and can freely stand without tilting the package backward or forward. Typically each wave in this line contains between 5 to 9 figures. Mattel produced and released 20 waves worth of figures. In addition since Wave 2 Mattel had added in each wave variation figures whereby one or two or more figures would be produced differently making two figures of a given character for collectors to track down. Aquaman, Firestorm and Superman each had variations in this wave. 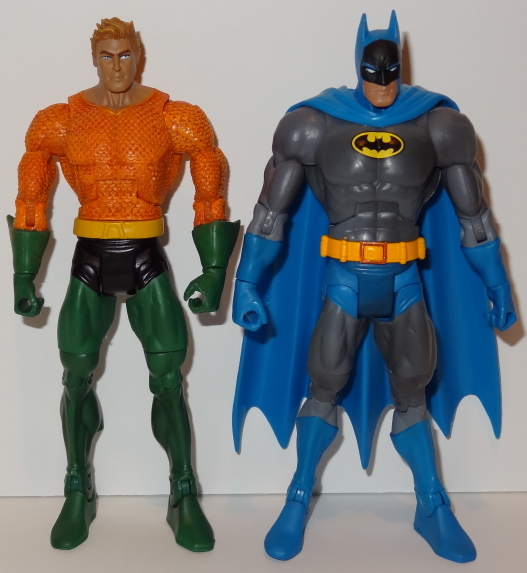 Aquaman was produced in his traditional short hair style resembling the classic version of the character with a variant figure of him made to represent his 1980s style with longer hair, different face and arm/wrist bracelets. Firestorm came as Jason Rusch-African American with a variant figure in his first incarnation of Ronnie Raymond-Caucasian American. Superman also came with a variant figure with his Superman Red uniform representing a Superman storyline after his original death in the 1990s. He was of course produced with the Blue costume representing the other version as well. 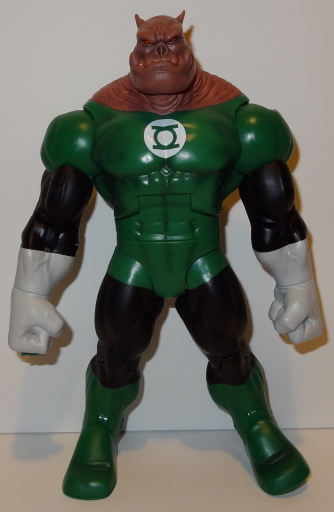 Mattel created the spin-off line called the Green Lantern Classics including the likes of Star Sapphire, Kyle Rayner, Manhunter, Black Hand that are essentially a part of the DC Universe Classics umbrella concentrating on the Green Lantern mythology of characters. Each wave has an added bonus that originated in Wave 1. 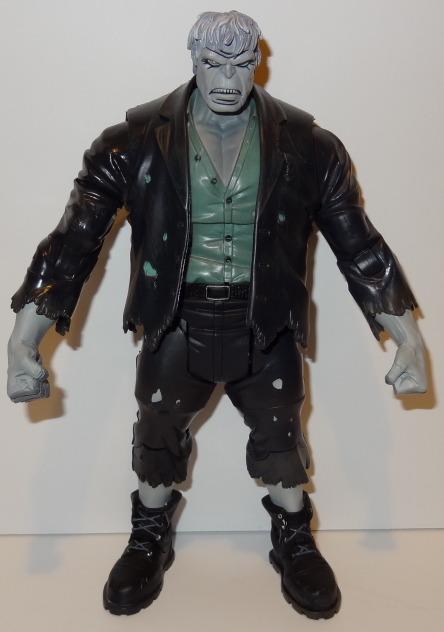 Mattel capitalized on Toy Biz and Hasbro’s method of including a body part to create an additional exclusive figure to that wave. Most figures in each wave would contain an extra part to create a particular bonus figure fro that wave also known as Collect and Connect. 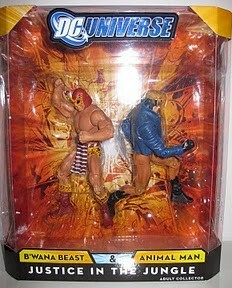 Some folks reference them as Build a Figure as well taking the namesake from the Toy Biz and Hasbro versions. 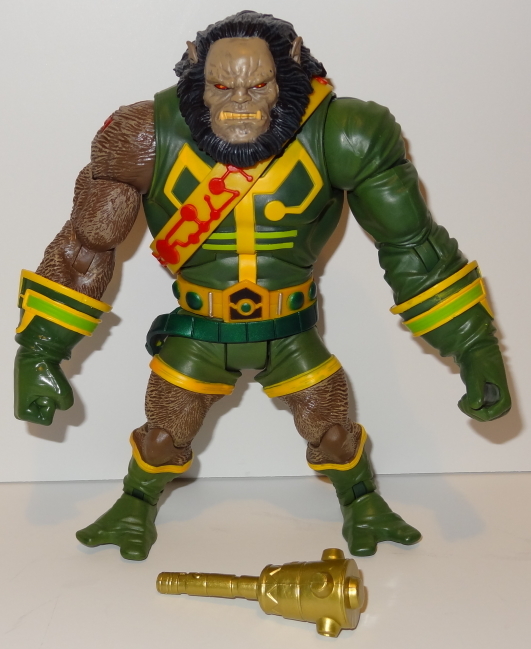 Wave 1 consisted of Batman, Demon, Orion, Penguin and Red Tornado with Metamorpho-Rex Mason the Elemental Man as the bonus Collect and Connect figure. Each of the 5 figures in this wave would contain a Metamorpho body part requiring collectors to buy all 5 in order to get all of the parts to build the Metamorpho figure. It’s been great fun for us collectors to collect the entire wave and construct the Collect and Connect figure. Some of the greats in this concept are the aforementioned Giganta and Chemo with others like Gorilla Grodd, Darkseid, Kilowog, Solomon Grundy, Kalibak, Despero, Metallo appearing as the feature figure in their respective waves. Some figures in the wave do not come with a part. Those usually included a figure base as the add in accessory along with their appropriate weapons. Mattel wanted to ensure that a core character be included in every wave with some of the lesser known characters containing the Collect and Connect part. 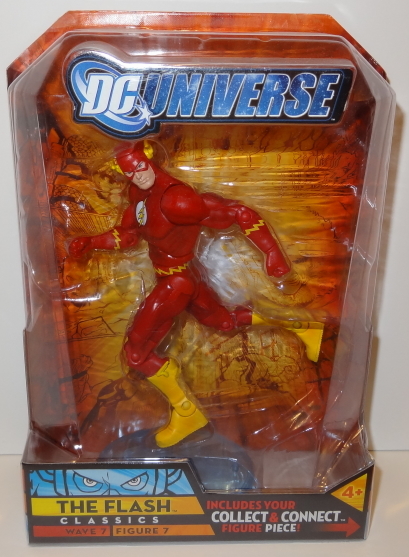 In Wave 7 the Atom Smasher was the Collect and Connect figure with the Flash as the core character whom did not contain an Atom Smasher part. He came with a clear bluish base with the DC Universe logo in scripted. In Wave 9 for example Chemo was the Collect and Connect figure with Green Arrow as the core character in that wave and did not contain a Chemo part. He too came with a clear bluish base with the DC Universe logo inscripted. This has been sort of trademark for Mattel with this line, but they have also tried to pay homage to the legendary Kenner Super Powers line from 1984 by making a figure from that line to be the core figure without the Collect and Connect figure part in other waves. 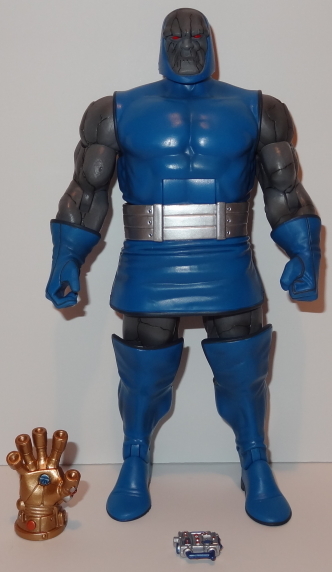 An example would be Wave 12 which was the Darkseid Wave with Desaad having been a figure from the Super Powers line emulating that figure with its accessory-a clear bluish base with the Super Powers logo emblazoned on the base. They have produced some exclusive figures as mentioned earlier which were only found at select retailers like Toys R Us, Wal-Mart, Mattel’s Mattycollector site and San Diego Comic Con. Some great items have been the Abin Sur and Green Lantern 2 pack, Cyborg Superman and Mongul 2 pack, Animal Man and B’Wana Beast 2 pack, Superman and Parasite 2 pack and the Gotham City 5 pack which featured Batman, Superman, Catwoman, Lex Luthor and Two Face. Mattel has found ways to bring back big name character figures and past hot figures to ensure that collectors who missed out have the opportunity to acquire them later on. They’ve brought back the likes of Green Lantern, Superman, Wonder Woman, Aquaman, Flash, Robin, Captain Marvel-Shazam, Black Adam, Deathstroke, Joker and have gone so far as to creating a subset line called World’s Greatest Super Heroes and All-Stars to incorporate some of these into. It keeps things fresh and exciting and introduces the figures to many new collectors. Some collectors have incorporated this line into their action figure collections wholeheartedly while some collect only this line of figures. Some have focused on specific characters or particular waves while some have concentrated on the Collect and Connect figures only. When you think about what Mattel has been able to produce, a collector can assemble the main components of the Justice League of America, the Legion of Doom, Green Lantern Corps, Teen Titans, Batman’s rogue gallery, Superman’s host of villains and many, many more. Even the large Legion of Super-Heroes team has been tackled in a Mattycollector online exclusive box set. It’s really any collector’s choice on which way they want to collect this incredible line of figures. 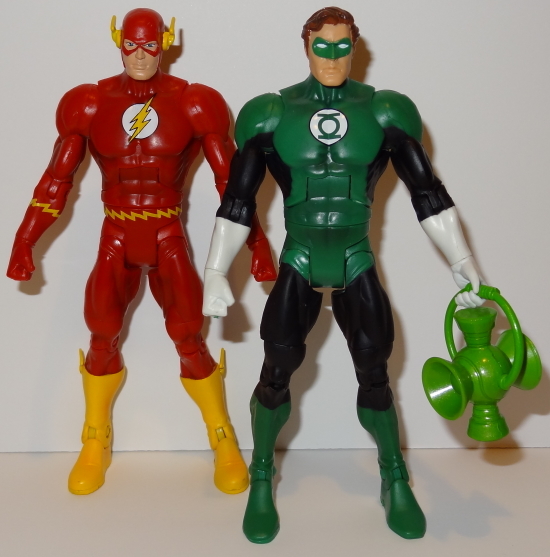 Although Mattel announced in the late summer of 2011 that the DC Universe Classics line would end, it does not mean that they will stop producing 6 inch scale DC Universe figures. We will continue see Mattel producing DC figures with different brand names and labels in the same scale as the DC Universe line for example Batman Legacy and DC Comics Unlimited which utilize the same kinds of sculpting/tooling. There will also be exclusive Club figures on Mattycollector further offering newly produced figures. 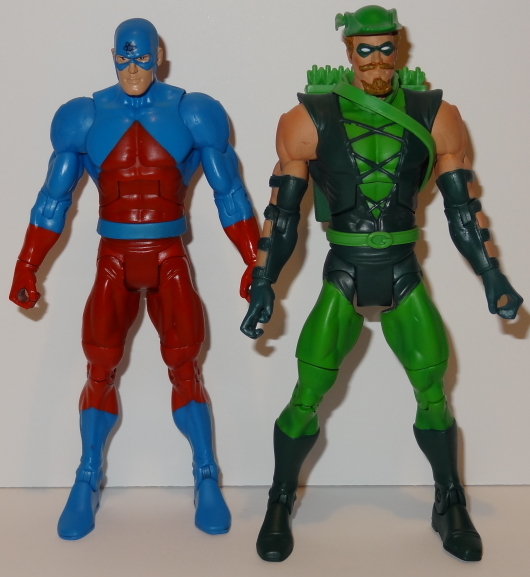 If you want to expand on things with the DC Universe figures, they are compatible with the Marvel Legends figures and other 6 inch scale figures. I find that the best way to start collecting these figures is to examine and look for the current offerings at toy stores like Toys R Us, Target, Wal-Mart, K-Mart. 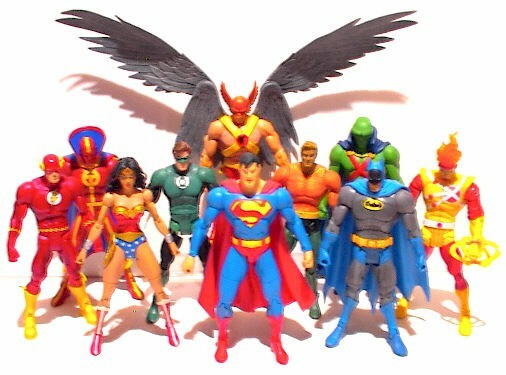 Checking out comic book stores and comic book shows is another source for DC Universe figures. After checking these sources you can try looking for them online. Check Mattel’s collector web site-Mattycollector. They usually have offerings every month and you can actually subscribe on an annual basis to avoid missing out on any exclusive items that sell out before they are available to non-members. The monthly sales typically start in and around the 15th/16th of each month. Browsing through Big Bad Toy Store’s web site may be an option. They usually carry current and some past waves that are no longer available at retail stores. Sometimes they create their own assortments allowing one to pick up figures that were only found in one particular wave. It’s their way of mixing and matching things up which do not conform to how Mattel released the figures originally. 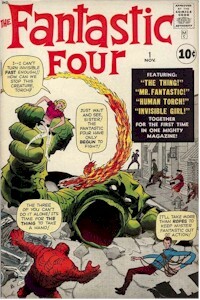 Amok Time’s web site has a nice selection too. They’re a competitor similar to Big Bad Toy Store. 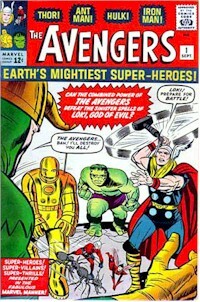 Entertainment Earth’s web site is yet another option like that of Amok Time and Big Bad Toy Store. K-Mart’s web site typically has DC Universe figures available and should be checked out. Toy R Us’ web site may yield some success too. Wal-Mart’s web site tends to sell out of DC Universe fairly quickly so you have to be fast when you hear of news of latest releases becoming available. Examining the above retailers' web sites may yield newer figures while Amazon.com’s web site will offer you both new and old figures. Amazon.com is a great source since there are various sellers that have created their own e-store so you get a wide variety of offerings at various prices. 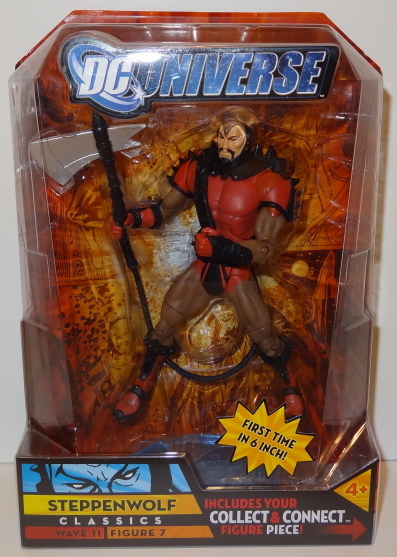 I have created this page with direct links to just about every DC Universe figure ever made that are available for sale on Amazon.com's site. You'll also see multiple listings for each individual direct link that can be further drilled down to find even more sellers selling the same figure at different price points. It's a great way to comparison shop and there are plenty of historical data and purchasing information about that listing and seller that will provide you the necessary information so you can decide on which listing is good for you. If you’re looking for older waves primarily, Ebay is typically my preferred choice. There’s a lot of collectors/sellers/dealers always looking to move in and out of product and DC Universe is a product line that they know will sell for them since so many collectors want them.